Around this time last year, Jonathan and I were discussing what we have been playing on The Reformed Gamers podcast. He would almost always bring up a game produced, or published, by Square Enix and it would somehow lead back to Final Fantasy. I always found myself shaking my head and wondering just what it was that made the series so great. The only one I had played up to that point was Final Fantasy XIII on the Xbox 360. Unfortunately, I don’t remember much of the game except for that I was frustrated at one point and set the game down for good. I did not touch a Final Fantasy game since then, save for when we recorded our review of Type-0 HD. This past Christmas, that all changed and I get it now. The one that started it all. For me, at least. With the money I received from family, I had enough to purchase a Playstation Vita again; I had to sell mine prior due to bills. While downloading all of my games back to the new device, there was one game that stood out: Final Fantasy IV. Watching the game download to my Vita (because I like to watch the progress of my game downloads, as weird as that sounds), I decided I would play through Final Fantasy IV to see what my friend, and co-host, was excited about. Fast forward to today and I have just recently finished Final Fantasy X, the 5th Final Fantasy title I have completed since 2016 began. That’s right, I played 5 Final Fantasy games back-to-back since January. Am I crazy? Probably. But now, I get why people across the world have admiration for these games. From Cecil’s guilt over the events that take place during the intro to Final Fantasy IV, to the eclectic and well-developed cast of Final Fantasy VI, Cloud’s struggle with who he is in VII, the crazy time bending ending of VIII, and Tidus’ facing his father in X, these games deal with some heavy themes interwoven in rich story-telling. But the one recurring theme I have seen in every Final Fantasy is hope. Despite all the darkness, despite all the trials, despite all the seemingly-endless hours of grinding, at the games’ core lies hope. Hope that good will prevail. Hope that will someday end evil’s reign. Hope that everything will be alright. As a Christian, I can relate a lot with hope. One of the core tenants of Christianity is placing faith in Jesus Christ. This pushes me to rely on hope daily. Without it, I have nothing; I have no hope. These games remind me of my need for Jesus Christ when I play them but also, my need for Christian community. When you play a Final Fantasy game, you have a party of different characters with their own set of unique talents and abilities. Just like how the body of Christ has different talents and abilities that we all use to work in unison for God’s glory. When the character’s in Final Fantasy work together in harmony, they accomplish some monumental tasks. Perhaps Final Fantasy really means Final Hope: the one hope to rid the world of darkness. Or, it just means Fantasy because that’s the genre and chocobos scream, “FANTASY”. Seriously. 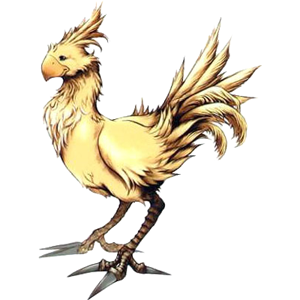 This is a chocobo. Where are you going to find something like that in the real world? It’s these rich stories with a vibrant cast of characters that feel real and authentic, an active and strategic battle system, and foreign worlds that keep me interested in the games. Now, having finished Final Fantasy X, I look forward to trying out Final Fantasy XIII again. And, if you’ve listened to the podcast, you know my constant talks on Persona 4 Golden and how amazing the game is. Well, folks, I’d place these games right up there alongside Persona 4 Golden. Yeah, it’s that good. As usual when Final Fantasy is brought up, there is one question that is always asked: Which one is your favorite? For me, I would say Final Fantasy VI is my favorite. Why? Because it’s a powerful picture of the Christian life. (spoiler alert if you’ve never played the game) There is a point where the bad guy wins. He successfully destroys the world. The character Celes wakes up a year after the world is destroyed, put into ruin, struggles with depression but then finds hope. That hope that carries us when we are at our lowest. Strength renewed, she sets out to gather her friends together to make one last attempt to fight this evil. The game places a heavy emphasis on friendship, unity, hope, and the idea that one day, good will ultimately win. It reminds me that, though temptation may win the day, in the end, Jesus Christ has already won the war. And there is a day coming that Jesus Christ will stomp out evil for good. If you have never played a Final Fantasy game before, I would highly recommend you at least try one out. I would of course recommend Final Fantasy VI, simply for the story but also because I feel it’s been the most well-balanced of the 5 games I have played. You can also try Final Fantasy VII, which boasts a strong battle system and the famous ‘Materia’ system. Whichever one you play, keep in mind the life of the Christian and see what parallels you can draw from the game. I’m sure you’ll have your very own favorite Final Fantasy game very, very soon. Wow. I really liked this write up. 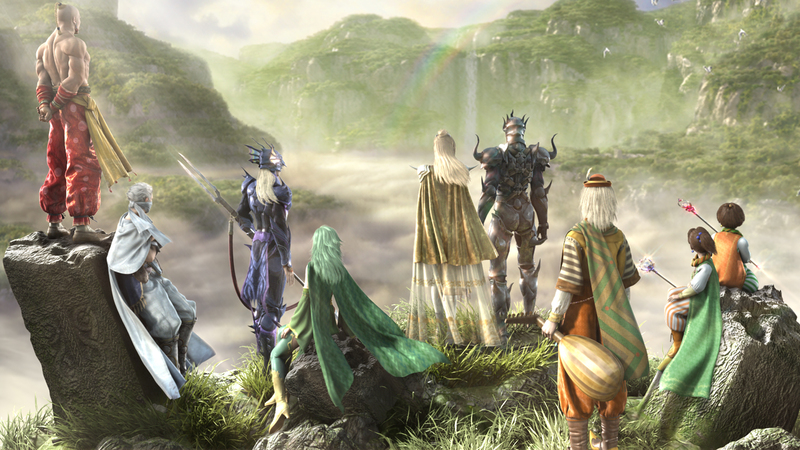 My brother and I would always talk about the religious aspects of Final Fantasy and how they relate to Christianity but I never thought about your party as various parts working together (1 Corinthians 12). I will play Final Fantasy games in a whole new way from now on. Thanks. You’re welcome, Cyrus! Glad I could bring a new perspective. Which FF game is your favorite? Definitely FFX, but probably because it was my first. Also, be ready for a lot of disappointment and confusion with FFXIII, especially when you get to it’s two sequels. In fact, XIII is actually a decent game, it’s the sequels where it gets bad. I’ve heard XIII gets really convoluted. Apparently, XIII and Type-0 share the same “universe”, hence all the L’Cie talk, so I’m hoping it doesn’t get quite as bad as Type-0 did. But we will see! Yeah, don’t get me started with Type-0. I just finished it last week and it is by far the worse! I don’t think they share the same universe though. Of course I hear all the similar names, but aside from similar naming, they seem completely different. I hope FFXIV goes 100% it’s own direction instead of trying to share the same universe. It did not work well with Type-0 and in my opinion, that game could have been so much better had they not tried to relate it somehow by throwing gibberish at us. I wholeheartedly agree! Another major flaw with Type-0 was that it requires two playthroughs to get the whole story. Not a bad idea on paper but you have to make the first playthrough good enough to warrant a second time through. I’ve been slowly chipping away at the XV demo and thankfully, it’s way better than Type-0 in just about every way. It got me very excited to play the full game this summer. I refuse to play it again so I guess I miss out on the story… But, play that demo ASAP! It is so good. The music reminds me of FFX and Kingdom Hearts. And it’s just so good in so many ways. So different, yet so many similarities. Especially that scary creature at the end (avoiding spoilers). They do a great job with legitimately making me afraid, especially in the darker missions. Looking forward to hearing you talk more about KH and this demo in future podcasts. You’re welcome, brother! Thank you for the words of encouragement! Trust me, it wasn’t easy playing through 5 Final Fantasy games back-to-back. It was all fun and games until I reached VIII. That’s when the struggle bus rolled into town lol but have fun playing through them! It blows my mind I had been missing out on such an incredible series for so long.